What toddler hasn’t thrown meals onto the floor that their mother lovingly prepared — over and over again? Or who doesn’t have a toddler who seems to eat next to nothing for days on end and on other days seems to not want to stop? Naturally, all these things can make a parent worry if their toddler is getting all the nutrients he needs. So, could toddler formula be the answer to help ensure toddlers get all the nutrients they need? You don’t have to travel far to find shelves stacked full of powdered formula products. Some formulas are made for babies under the age of 12 months. These are called infant formulas and are designed as a breastmilk substitute for babies who are not breastfed. There are also very similar looking tins that are marketed at children over the age of 12 months. These are called toddler formulas. There is a reason they are made to look identical, if you read on, you will understand why in point 7. Formula companies market their products very well. However, scientific evidence to back up their claims is seriously lacking. It’s important for families who use formula to be able to make informed decisions, based on information they can trust. The information needs to be independent, and not driven by profit motives and marketing hype from the formula industry. #3: Is Toddler Formula Necessary? Special complementary foods or milks for toddlers are not required for healthy children. consistent with the Australian Dietary Guidelines. Solid foods should provide an increasing proportion of energy intake after 12 months. Offering a variety of nutritious foods is likely to meet most nutrient needs and provides a basis for healthy eating habits. To find out the differences of what’s in formula and what’s in breastmilk, read our article here. Toddler formula may contain ingredients that are not healthy for toddlers. “The formula may also be sweetened, which is unhealthy. Flavours also mean unnecessary artificial additives in the child’s diet,” Joy says. 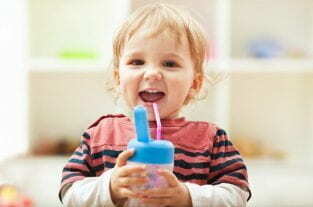 Toddler formula may also reduce iron absorption. “It’s also very hard to provide iron in a cows milk formula, as the milk is naturally high in calcium and these two minerals compete for absorption. It is better to have them in different foods in the diet,” Joy says. The WHO Code was designed to help prevent exploitation with formula marketing. Australia responded to the WHO Code with the Marketing in Australia of Infant Formula (MAIF) Agreement, which is a voluntary, self-regulatory code of conduct between manufacturers and importers of infant formula in Australia. The MAIF Agreement says that companies must not promote infant formula (for ages 0–6 months) or follow-on formula (for ages 6–12 months). Toddler formula (from 12 months on) is not part of these agreements. Hence, marketing of toddler milks has no restrictions and are aggressively marketed. Research shows that many parents don’t differentiate between infant and toddler formulas, but rather only recognise the brand — which is where the first point of this article comes into play. Formula companies make both infant and toddler formulas identical in order for you to recognise the tin, hence buy their formula for your baby (despite the advertising being for toddlers). It seems Australia has a way to go in terms of the regulation of formula. While the MAIF Agreement helps somewhat to promote and protect breastfeeding, implementing the WHO Code would be much more effective. This could be one step towards helping to improve breastfeeding rates and normalising breastfeeding a toddler and beyond. In the meantime, toddler formula is not necessary for healthy toddlers. NOTE: If you wish to make a complaint about a formula company’s advertising (due to a violation of the MAIF), the advisory panel for breeches was abolished a little while ago, due to government cut backs. However, complaints can now be made directly to the department of health. Just wondering if you think it best for a 15month old to stay on follow on formula or just no formula at all. We have always mixed fed, and I have started using toddler formula after nursing but from reading this article I am wondering if she even needs it and if I can drop the bottles all together. She eats well. Hi my daughter is still breastfeeding. She is 21 months old she does eat fruits and vegetables and regular food but she wont eat meat. Her doctor said as long as she is eat foods with protein and other nutrients she is ok so she doesn’t need vitamins. I just want to make sure she is getting everything she needs because she use to have low iron but that’s fine now she hates cow milk like her dad . So she is on vitamin d . Would toddler formula be a good choice or should we do pediatric shake or just make sure she keeps eating fruits , veggies stuff like that. I’m not gonna stop breastfeeding and I was not sure if the formula or shakes would be ok while breastfeeding.